Memory Sockets accept 16-bit/32-bit SO-DIMM assemblies. Suited for communications equipment and peripheral devices, 144-position, 0.8 mm pitch Series 10062086 measures 5.2 mm tall and provides 3.3 mm separation between top surface of host board and installed module. Horizontal sockets employ mechanical voltage keying to differentiate between versions that accept 2.5 V DDR or 1.8 V DDR2 memory module assemblies. Compliant with JEDEC-defined 16b/32b Socket Outline, sockets are designed for surface-mount solder termination. 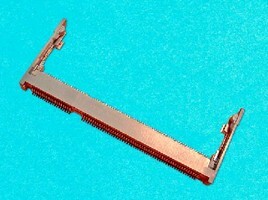 ETTERS, PA (July 11, 2006) - FCI, a leading supplier of connectors and interconnect systems, has developed 144-position, 0.8mm pitch horizontal sockets that accept 16-bit and 32-bit small outline dual in-line memory module (SO-DIMM) assemblies. The 10062086-series sockets are 5.2mm tall and provide 3.3mm separation between the top surface of the host board and an installed module. The connectors are ideal for use in communications equipment and peripheral devices such as mid- to high-end printers and copiers. "The connectors have an enhanced latch system design that improves reliability," said Alan Chen, FCI Product Manager. "The hold-down clip mechanisms at each end of the connector act as physical stops to prevent over-rotation of the memory module during installation and to protect against over-extension of the flexible latching arms during module insertion or removal." For more information about memory module connectors, contact FCI at 825 Old Trail Road, Etters, PA 17319-9351; call 800-237-2374, e-mail at electronics.us@fciconnect.com or visit FCI on the web at fciconnect.com/ddr.